Wedding gifts are typically more fun for girls to open because it's a lot of new kitchen gadgets and things for the house. Dave was really hopeful that some of the items would be exciting for him to open as well....he was pleasantly surprised. Not only did he get several gift cards to Lowes from people Grandpa Wolters did the shopping for him and grandma and Dave was not disappointed by his selection! Dave not only got a wheel barrel and new yard tools (I'm not sure what was wrong with the hand me downs from my dad :-) just kidding - they were in pretty rough shape), he got his very own chainsaw. Not just any chainsaw, a really nice one in the world of chainsaws. I know nothing about them but Dave was geeked to saw the least! He's been looking for something to cut but hello, we live in the city! 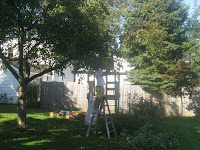 Finally last week I told him he could cut the crab apple tree in the back yard. It was 3 times the size of what it should be and bees were attracted to all the little apples.....not to mention the lawn is covered by them and then dies. I'm pretty sure a handsaw would have been sufficient but there was no point in arguing the use of a loud power tool. The tree is trimmed....a little more than I was hoping....but he and Jenna had a ball! 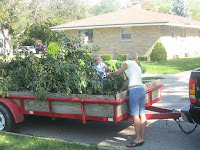 Before Dave could leave with the trailer, Jenna needed to pick the apples off the branches. She was all smiles digging through the branches in search of the tiny apples.